Hillary: We met on the set of the second season of Project Runway, way back in 2005, at the open call for Los Angeles designers. Katherine was the West Coast Editor of ELLE and ELLEgirl at the time, and was judging the LA talent who were auditioning for the show. I was there because I had just quit my full-time job as an editor in the features department at ELLE in New York, and was working on my first freelance project for the magazine—which was producing two mini magazines about the show for ELLE—so I was starting the background reporting necessary for said project. Let’s go back to the very beginning. Where did the idea for Who What Wear originate from and how did you bring the idea to life? Katherine: We were in our early 20s, and spending all of our time on the computer. We found it frustrating that we couldn’t consume the same type of content online as we were used to getting from our favorite print magazines. We felt compelled to reimagine the way women would consume this content on the internet, so we created WhoWhatWear.com as a daily updated newsletter and website. The digital space has changed drastically since the launch of Who What Wear. Can you tell us about those transitions and how you keep up? Katherine: It’s our job to keep an eye on (and help to constantly redefine) the changing media industry on a daily basis. It’s important that we are early adopters of all of the social platforms and that we are intimately familiar with the consumption behavior of our audience. When we started our business, we reimagined content on a computer screen, now it’s a mobile screen, and through social platforms. Tell us a little about who is working behind the scenes at Who What Wear. Katherine: We have about 170 employees largely broken up by three main departments: content creation, technology, and sales and marketing. Let’s talk about your latest project. What inspired you to write, The Career Code? Hillary: We started our company nearly a decade ago, and this endeavor made us learn everything about running a business really quickly, in a trial-by-fire kind of way. 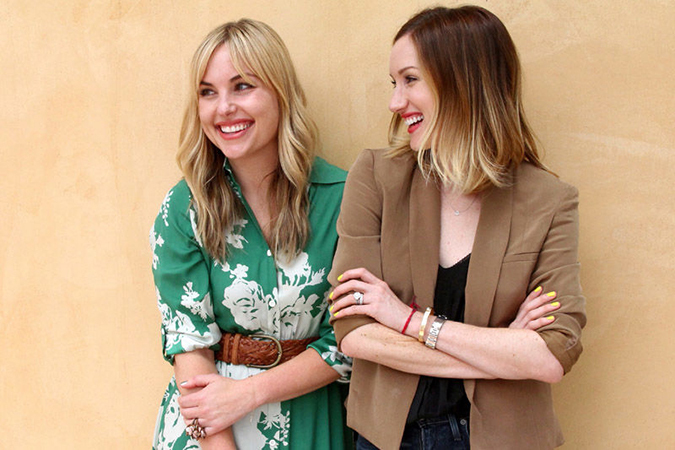 In that time, we’ve hired hundreds of people, built teams, structured a company, raised money, expanded internationally, created our ongoing Who What Wear line of clothing and accessories at Target, and navigated countless crises of every shape and size. Thanks to this background, we have an unusually deep understanding of what makes employees successful, and how it’s possible to truly create your own dream career in a smart, strategic way. We wanted to share everything we’ve learned in a really practical, actionable, easy-to-follow way, so that people can really use this as a guidebook for creating their own best career. That’s the hope, anyway! What is a common mistake you think ladies are making these days when it comes to pursuing their careers? Hillary: It’s been said many times before, but I think that women seem to have a harder time asking for raises. We have a whole chapter in the book—it’s called “Quantify Your Worth”—dedicated to ways that you can really prepare yourself for that conversation in your annual review, and strategically sell your achievements to your boss. What advice would you give a career girl looking to advance in her profession? Katherine: There is a chapter in our book called “The Most Proactive People Win.” We teach women to go beyond their job description, find opportunities for improvement within the company, a new stream of revenue, or white space in what’s being created. That’s how you get ahead. What was the biggest challenge you faced while writing The Career Code? Hillary: The biggest challenge was editing down the manuscript to fit the word count! Seriously: there’s so much to be said on this topic, and personally I feel like there aren’t enough practical books like this written by women and for women, so we really had so much to share. Hillary: Instagram for finding new restaurants and travel destinations, but Snapchat for day-to-day entertainment. Katherine: Snapchat – I love the tone and the humor, you need to be quick on your feet. It’s interesting to see the type of people who get it right. Hillary, you said that when you launched Who What Wear in 2006 that your goal was to have a clothing line in Target and in February of this year, your dream officially became a reality. What has it been like developing this clothing line with Target? Hillary: When we first started talking about having a line of Who What Wear clothing (and accessories!) at Target, it was a decade ago and frankly seemed like a very distant goal, so the fact that we’re actually doing it is so deeply rewarding. The development process is absolutely fascinating, on a number of levels. It’s really a combination of art (trend forecasting) and science (data of what our readers are shopping and when), plus we’re learning so much from the buying team at Target. And best of all, we’re getting the chance to use real-time input from our readers about what pieces they want us to make, which is so cool and fascinating. For example: our Snapchat followers got to vote on which one of two pieces we should include in an upcoming collection the other day—how fun is that? 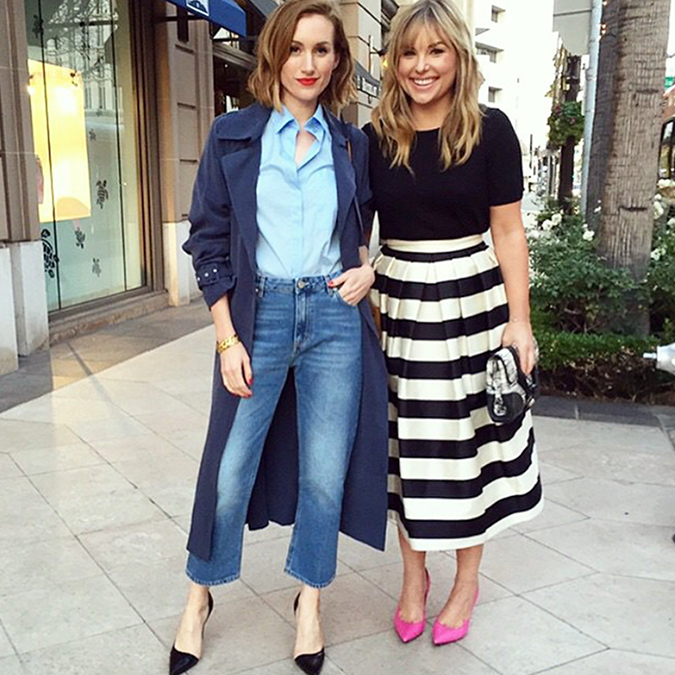 Can you share with us what we can expect from the Summer 2016 Who What Wear x Target collection? Katherine: Lots of festival-inspired looks. It’s more girly than our spring collection. Lots of airy skirts and dresses, a little bit ‘70s and a little bit boho. Katherine: I get up at 5am and make a matcha smoothie before my workout (matcha powder, vanilla protein powder, 1/2 banana, ice, hemp milk). When I get home I usually have a fried egg, with a little brown rice, crumbled goat cheese and avocado. For lunch I typically eat a salad with some type of protein. For dinner, usually grilled chicken, fish, turkey burger, or some grilled shrimp with a veggie and (more) brown rice or quinoa. Hillary: I’m not a huge breakfast person—I have to force myself to eat in the morning—but I typically have a black coffee and a Kind Maple Pumpkin Seeds bar. Lunch is usually a salad; there’s a white bean, arugula, chicken salad at the cafe downstairs from our office that’s high on my list right now. I usually go for weeks eating the same thing, and then switch. Dinner is a total wild card, depending on my schedule. On lazy nights, I make something I call kitchen-sink rice (meaning, everything goes into it, except for the kitchen sink), which involves kale sautéed in garlic and red chili flakes, brown rice, some sort of spicy chicken sausage, avocado, and Sriracha. Sometimes I’ll throw in roasted butternut squash, sweet potatoes, or cherry tomatoes, sometimes I’ll do a vegetarian version and will add spicy pepitas, sometimes I’ll fry an egg and put that on top—it all kind of depends. What has been the best moment of each of your careers? Paint the picture for us. Katherine: Seeing our Target collection in stores. The thing about having a digital brand is that you never really interact with anything tangible. Being able to see one of our brands in real life, and worn by someone we don’t know, has been really exciting after 9 1/2 years of very hard work. You just moved into a new office space. Can you tell us what that transition was like and what the move has meant for you? Katherine: We have always had amazing spaces, but this takes the cake. It’s about 30,000 feet of floor to ceiling windows, with a gigantic outdoor terrace where our employees can work, meet, or eat throughout the day. If you could be a celebrity for a day, who would you be and why? Hillary: Stevie Nicks, the day of her 1981 photo shoot for Rolling Stone, when she sang a version of “Wild Heart.” The behind-the-scenes video of it is one of my favorite things, especially because it’s a one-of-a-kind version of the song, in which Nicks is singing her words over a demo of “Can’t Go Back,” which was written by her bandmate/ex-boyfriend, Lindsey Buckingham, and ended up on Fleetwood Mac’s 1982 album, Mirage. It’s basically the best mash-up ever. For all of the dreamers out there, the fresh out of college future entrepreneurs, what advice would you give them? Hillary: Be prepared to work harder than you ever knew was possible! When you’re an entrepreneur, you’re never really “off duty,” and that can be a big adjustment, which is why you need to really take the time to figure out what you want to do. You spend so much time at work and thinking about work, so it’s important to really be inspired by your company and career. Katherine: Find something you love to do, and figure out a way to get paid for it (this is also a chapter in my book). 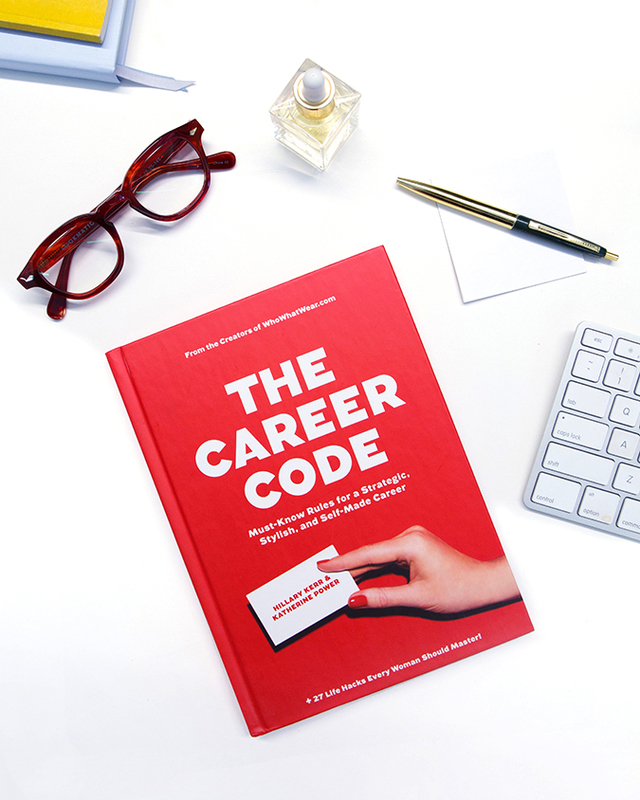 The Career Code comes out May 17th and you can pre-order it here! And be sure check out Who What Wear on Instagram here!